Korean is the third line from the bottom. It's not every day in America that I get to see Korean written and with the exception of some computer manuals and Korean products it goes largely unseen. Today at work I saw this on the printer and was pleasantly surprised to see it. 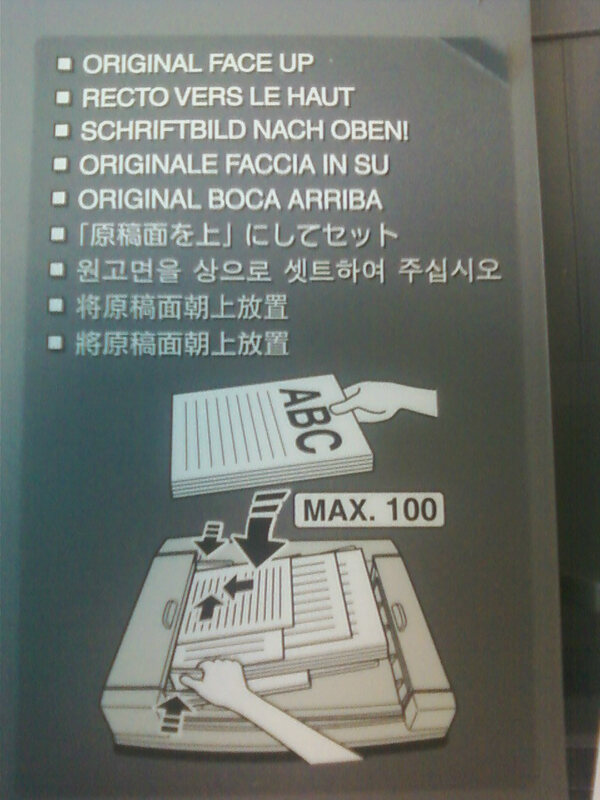 Sure it's written in 9 languages but I don't let that take away my joy. It was a Korean moment and only I could really appreciate it because no one else has mad Korean skills like I do, but I can say without a doubt that no one else here really cares as much as I do! Ahhh... Now that makes me a feel 'normal' again. Does anyone else have these moments when they see other languages written, or hear them spoken? Doesn't it make you feel at ease just knowing that you understand it? I have the moments.. Especially for dialects. When I can understand English in odd dialects other than my own, it feels satisfying. D4, I too really like dialects. Be they from Australia or some obscure dialect from North Carolinian cow fields... I like to guess people's origins based upon the way they speak English. It's like an amazing game or contest except I cannot get paid for it. Jay, you're right, it's a lot less secret than it seems... In North Carolina where I live there are very few though... Spanish used to be like secret code for Americans but now we're all hispanic apparently. We'll at least learn to dance better out of all of this! Shutterbug, do you have a secret code you use? What languages do you speak besides English? I want to learn more! Yeah, not exactly as you described, but I remember the first time I went to Japan, which was only about two months after I moved to Korea. I was on a visa run because my contract was sold, and it was the first time that I had traveled entirely by myself. I remember walking around aimlessly, feeling the most alone I ever have in my life (though, in a sense, enjoying it), and coming across a Korean tour group at Osaka castle. I knew no Korean at that time and was lucky that I was even able to pinpoint the language, but hearing Korean spoken in Japan brought a sense of comfort that is hard to describe. Korea was still a very foreign place to me, but it was more familiar that Japan. The only way I can explain the feeling is that it was like being hugged by someone that you only recently met, yet had already fallen in love with.